In the past 12 months, Mercedes, the benchmark of luxury vehicles, has launched something in the region of five models, including the new C 63 Coupe, C 43 Coupe, E-Class and SLC 43 Roadster among others (and that’s not even including the IAA and autonomous ‘Vision’ concepts). And these are NEW models, not counting the convertibles, facelifts and new engines launched for, well, pretty much every other car on its line-up. By comparison, it’s taken Rolls-Royce 14 years to launch the same amount models, four of which you can still get from the catalogue. That alone should explain what a momentous occasion this is. The new model in question is the Dawn, a new four-seater convertible that sits alongside the Wraith coupe on Goodwood’s line-up. Unlike the Phantom convertible, the Dawn has a more modern and much younger look, with a windshield that is not supported by a pillar and an interior that is plush with meticulously balanced leather and wood. If you think of the Phantom as a tank for the silver-plated Tycoon, the Dawn is more hot-rod-ish, more focused on hair mousse than SPF50 scalp protector. It seems fitting, for Rolls-Royce, as far as I’ve seen, is the only brand that can pull anything off. Our test model today for instance is Navy Blue, with orange stripes and a bright orange interior. It’s what marketing would call a ‘bold’ combination which, in layman’s terms, means it’s going to be hideous. And yet, inexplicably, it works. How, I’m not so sure, since I’ve also seen my fair share of taxi yellow, cotton candy pink and even camouflage green Phantoms that also seem to fit the profile. Not that I would, but I am certain you could affix a teddy bear to the windshield and a skull pendant on the rearview mirror, and said the Dawn would still look chic parked outside the yacht club. 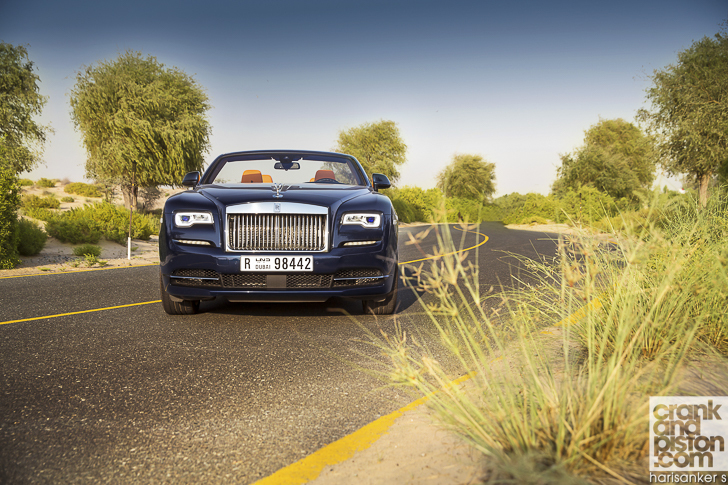 That says a lot about both the profile and presence of any Rolls-Royce, and the company’s new convertible is certainly no different. ‘Plush’ and ‘style’ then are the two adjectives I’m most interested in with the new Dawn, and it’s not too long before both are met. Climbing in through the rear-hinged door, one of the first things I notice is the cushioned carpet. It’s so thick and soft it feels like a Persian rug, and the temptation to drive barefoot would be enormous were it not for some barbed comments already being made by the crankandpiston.com photography crew. There are a couple of BMW familiar centre pieces – the rotary dial for the infotainment system being one of them – and the ridiculously slim stalks on the steering column border on fragile, but there are some truly stunning details: I’m pleased to see two umbrellas are still housed in the panelling next to the front wheel arches, and the cabin’s switches and buttons are so beautifully machined, Rolls-Royce could sell them as table ornaments. Plus, soaking in the cabin design takes longer than I thought: it’s a while before I realise that there is a small button next to the door that closes it automatically. I have been stretching for nothing. Ready for the off (which is no Le Mans event in a Rolls), I calmly rest my finger on the understated starter button on the dashboard, and push. Nothing happens. Well, not ‘nothing’, but not what I’d expected. Turns out this pro has just switched the car off. Even though there’s a twin-turbo V12 under the bonnet pulling air in through the front grille like an overly energetic hurricane, the purr at idle is so damn silent I can only tell the engine has been started by looking at the temperature gauge: I really must ask if Rolls-Royce is planning a hybrid any time soon, since they’ve clearly got the silent start-up down. The only thing to do is fire the engine back into life, put the air conditioning on max, and direct the air-vents to my now slightly reddened cheeks in the hope this will cool them. I select drive on the column-mounted transmisison stalk, hoping the sound of ever-increasing sniggers is silenced by the wind as we pull away. Or Adele, for that matter. 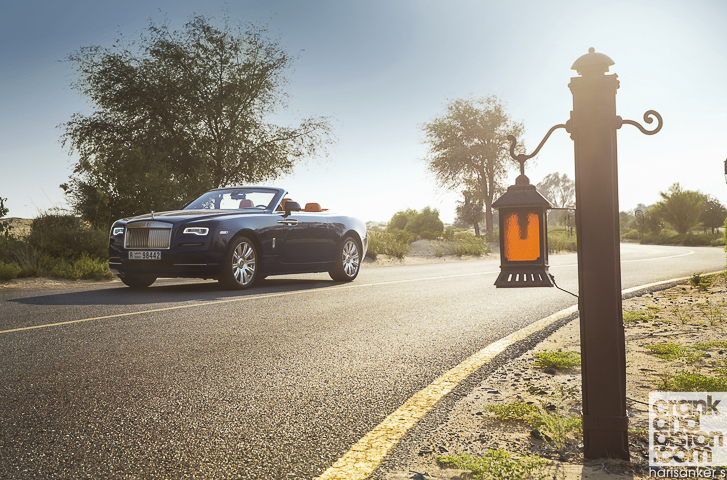 Rolls-Royce has trusted nobody with the Dawn’s acoustics, preferring to develop everything in-house. And that is saying something from the country that makes Linn, Naim, Cambridge Audio, Arkam or Musical Fidelity. And it has paid off magnificently. I will not say this is the best audio system I’ve ever experienced, but the 16 speakers work fantastically well in terms of fidelity and sound pressure. Indeed, had this been any other car, I may well have paid more attention to the sound system and bent your respective ears for page after page. My attention though is drawn, as our drive gets underway, by…well, pretty much everything. Life really is different in a double R.
Take the seat massagers. Not uncommon for a luxury model, the Dawn featuring both heated and cooling options. However, instead of the back and lumbar systems, this one subtly tilts your posterior left and right, which is – apparently – more ‘effective’ for long distance drives. It’s an oddly focused area of practicality given that, in other areas, this seems to have been forgotten. The boot, for instance, is tiny. At 244 litres, it is not so tiny that you cannot put a golf bag in it. It’s so tiny, you can barely put ANYTHING in it, given the position of the roof’s mechanics. Consequently you may want to rethink packing underwear, creams, balms, a night gown, the tuxedo, three pairs of shoes (dinner, dress and casual), and the sports blazer a weekend trip to your place in the Hamptons would require. The golf bag? That can only go on the back seat. Yes, the ‘effectiveness’ of the seat massagers is a nice touch, but Rolls does seem to have missed the point. Still, when we’re finally on the move, there are other, more salient points that peak my interest. Palm driving for instance may not be wise in a 6.6-litre twin-turbo V12 that delivers 563bhp and an outstanding 575lb ft of torque, for numbers such as these catapult the 2.5-ton road boat to 100kph in just under five seconds and result in a 250kph top speed. That’s up there with the BMW X5 M, not that any of this can be put to the test on the opening leg of our run, strewn as it is with cobblestones and sleeping policemen that carry a heftier challenge for the suspension than anything else. A test said wishbones nail with flying colours. Only a model that sails more than drives, slicing through potholes and speed bumps like they are not even there, is deserving of the Spirit of Ecstasy, and I’m immediately gratified to see that, on the Dawn, it has not been misplaced. It’s a similar matter with the civility, our drive – cushy and luxuriating as it is across the hours that follow – serving to bust a myth that has been roaming around for ages. Apparently, at 100kph, the loudest noise in the cabin is the dashboard clock. Lies. This clock makes no sound whatsoever (I even put my ear to it and nothing), a fitting statement for a cabin that allows neither road nor wind noise to cut through the opulence. And my my, is there a boatload of technical gizmos to help you with that: lane departure warning; cruise control; unbelievable amounts of power assisted steering. In a particularly neat touch, the front beams automatically deflect from oncoming traffic to avoid dazzling said motorist, rather than wasting your invaluable time by asking the driver to do it. There’s even a head-up display, on a Rolls-Royce of all things, and yet somehow, much like the retina-searing orange interior, it seems to fit, though mainly so you can see just how quickly – yet smoothly – that twin-turbo V12 reaches cruising speeds. Ah yes, the drive. 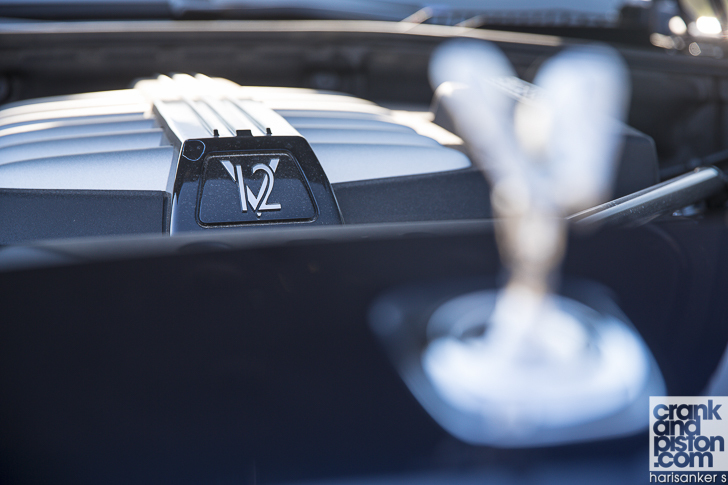 Perhaps you were wondering when we’d get to that, for despite the ‘more than sufficient’ 563bhp on offer, the possibly jarring HUD, and the fact it sits alongside one of the company’s ‘sportier’ models – oh, you know what I mean – the Dawn is, nevertheless, a Rolls-Royce. Far from assaulting the corners, these should be seen as an inconvenience. And yet the speed this two-ton luxurious creature is capable of would suggest there is more potential beneath those Persian rugs than meets the eye.